Use our pizza roll recipe to make tasty Seasoned Pizza Rolls! 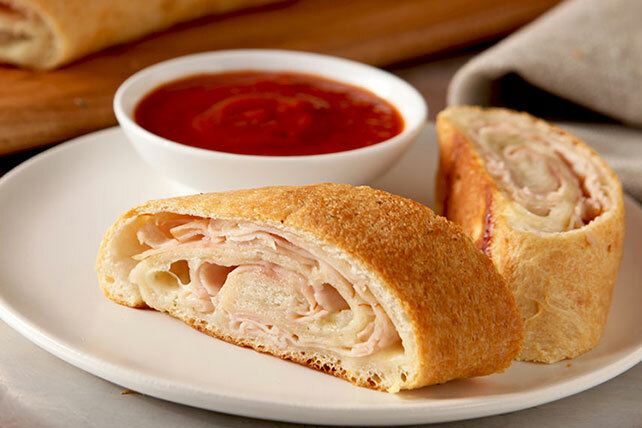 Make our pizza roll recipe with dipping sauce and you get an all-time best party appetizer. Mix butter and seasonings until blended. Unroll pizza dough onto baking sheet; press into 15x10-inch rectangle. Brush with half the butter mixture; top with cheese, onions and turkey. Starting at one short end, roll up dough to form log; pinch seams and ends together to seal. Position log lengthwise, seam side down, in center of baking sheet; brush with remaining butter mixture. Bake 15 min. or until lightly browned. Cool 5 min. before cutting into 16 slices. Serve with pasta sauce. Sprinkle your favorite cut-up fresh vegetables over the dough along with the cheese and onions before rolling up and baking as directed. Substitute olive oil for the melted butter.